World's fastest core clock speed isn't something you would like to say ten times fast (unless you want funny looks) but this is the impressive boast of Nvidia about its latest graphics card, the Zotac GTX 280 AMP! Edition . In tests the Zotac topped 700MHz straight out of the box – well, we presume the company plugged it in first – which, according to Nvidia is "so-far unbeaten by any other manufacturer." The new graphics card offers a massive 12 per cent performance hike over its now slower brethren, the GTX 280. But its only priced £20 to £30 higher. This equates to just a 5 per cent price rise – Nvidia's maths, not ours. 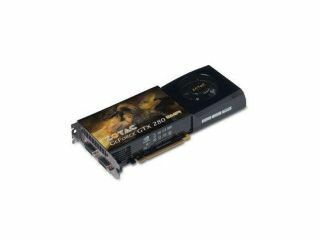 In a statement about the new graphics card, Carsten Berger, Marketing Director, Zotac, said: "Yet again Zotac has demonstrated its exceptional ability to design and engineer the fastest card on the market. "Overclocking the GTX 280's core by almost 100MHz is a fantastic achievement, but to then mass produce it and maintain a 5 year warranty is outstanding." The Zotac GTX 280 AMP! Edition is out now for around £450.